Inflation, soaring energy prices and the stress of exhibiting across the pond may leave some trade show managers feeling anxious, but with a little ingenuity and some advanced planning your trade show or trade fair experience in Europe will go smoothly. 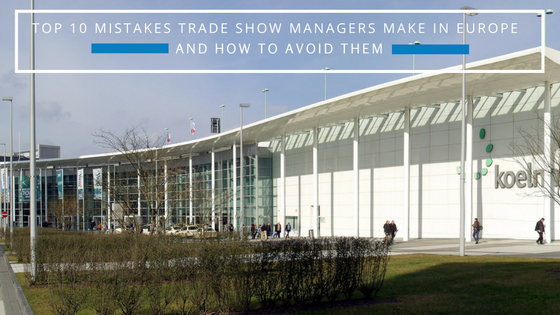 Norbert Hültenschmidt, Nth Degree’s European Manager, has zeroed in on the top 10 mistakes that trade show managers often make in Europe and, more importantly, how to avoid them during your next event. You order too much electricity. In fact, many inexperienced trade show managers have been known to order double the actual amount needed. In the U.S. for example, your exhibit may require six 16-amp (120 volt) outlets, or a total of 96 amps (non-math people stick with me on this one). On a German order form you see one 220 volt 16-amp outlet for $225. You also see a 220 volt 8-amp outlet for $125. In this scenario, an American trade show manager might order six of the 220 volt 16-amp outlets for a total of $1,350, plus the transformers required to convert 220 volt to 120 volt. What you may not realize, is that a 16-amp transformer will convert 220 volt 8-amp into 120 volt 16-amp, so you could order the 220 volt 8-amp for $750, which would save you $600 overall. Did you stick with me? You must have aced your SATs! You don’t realize that American crates are not designed for European applications. Shipping crates in the U.S. are designed to “cube-out” U.S. type delivery trucks and utilize as much available space as possible. In Europe however, U.S. crates are not designed to the measurements of European trucks and therefore exhibitors often end up requiring additional truck space and therefore will incur additional expenses. Another point Norbert Hültenschmidt stresses is that truck space costs coupled with fees for storing empty crates during the trade show can really add up. It is recommended that you calculate these expenses into your budget ahead of time. You don’t (fully) understand the difference between the metric and United States customary system of measurement - and the impact it will have on your trade show displays. The character, Jules, in the movie Pulp Fiction said, “You know what they call a Quarter Pounder with cheese in France? A Royale with cheese.” This is true, of course, because of the metric system in which American measurements just don’t make sense. The U.S. relies on the United States customary system of measurement, while throughout Europe (except the U.K.) the metric system is used. This really comes into play in terms of trade show display design. In Europe, a common booth space is 3 meters x 3 meters, which is 9’ 10 ¼” x 9’ 10 ¼” in the U.S. Trouble comes when a trade show manager does not alter his or her U.S. measurements and ends up with a 10’ x 10’ exhibit that does not fit correctly in their European booth space. I don’t think I need to tell you how frustrating (and costly) this scenario would be. You underestimate the need to book hotel rooms well in advance. Imagine you are 3 months away from your big trade fair in Geneva. You think you have ample time to search for a nice hotel and book accordingly. What you will soon discover is that hotels in many European cities are booked solid up to 6 months before a trade show or trade fair opens. In this dilemma, trade show managers end up booking hotel rooms for staff in distant cities, which adds extra cost to your budgets and added travel time to your schedule. Unfortunately, experience has proven, the only way to avoid this mishap is to plan for and book hotel rooms 9 months to 1 year in advance of the event. You don’t realize that U.S. Code regulations don’t apply in Europe. A common misconception among trade show managers is to assume that because they have met U.S. code regulations during a domestic trade show, that they will also meet regulations in Europe without any further work. Meeting code for items such as fire safety in France or Spain, for example, is much different than in the states. In the U.S. a fabric sign has specific fire prevention regulations, but each country also has their own set of regulations, which means that U.S. fire code regulations are not accepted in Europe. What this boils down to is the dreaded...paperwork. Show organizers provide exhibitors with submission deadline dates for all documentation. Your job as the trade show manager, says Norbert Hültenschmidt, is to complete all your documentation accurately and on-time. Procrastinators beware...by taking action in advance, you will avoid having to redesign complicated elements of your booth. You make the mistake of not arriving early enough to adjust to world time zones. I know you have a really tight schedule, but trust us on this one, nothing feels worse than arriving in a strange place in the middle of the day, your body aching for sleep, and then being forced to get to work immediately. It is always wise to arrive at least one day before your trade show set-up begins to become acclimated to the local time. Again, planning far in advance for overseas trade shows will help you do a better job in representing your company. It is advisable to arrive a day early during local daytime hours and not go to sleep until the locals do (this doesn’t mean you should stay in the pub as late as the locals do) in order to wake up fresh the next day. You misjudge the length of time it takes to clear customs on shipments. You expect to have an Americanized experience. You don’t anticipate the high-cost of using cell phones and communication devices overseas. Global communication soars to a new level when traveling abroad both in terms of importance and cost. Staying connected to the U.S. office, (or for some, using Instagram to show-off your Eiffel Tower pics) is certainly important, yet many trade show managers don’t expect such a high price tag for these activities. Simply traveling between locations can cost you $3 U.S. every time you connect to a new cell phone tower. One of the first steps you should take when traveling out of the country, is to check with your wireless provider about an international rate and data plans. Please also keep in mind internet connection fees for your laptop and other devices (I know you can’t live without 3 devices). The main hotels in Europe charge about 15 – 25 Euros per day to connect to their wireless internet services. Exhibitors should be aware of this additional communication cost and budget ahead of time for it. You overlook the importance of speaking in the local language. One of the most important aspects of exhibiting on a global level is to gain international status and to attract more qualified clients. How can you accomplish this? English is the exhibition language in Europe, but you will find that a large percentage of attendees will speak the local language. “Attendees are more comfortable using their first language and will be more inclined to approach and stay at exhibits where they are able to speak in their local language,” says Hültenschmidt. The solution – hire an interpreter or fluent speaker for the entirety of the trade show or at the very least, attempt to greet potential clients in the local language. “Sometimes just your attempts to speak the language will put the attendees at ease and offer them the opportunity to practice speaking their second language - English,” continues Hültenschmidt. Whether this is your first time exhibiting in Europe, or if you are almost out of pages in your passport, you can never plan too far in advance. Anticipation, managing expectations, allocating funds and planning ahead are just some of the points for success. Being savvy, having an open mind and integrating yourself into the local culture are also important. Pay attention to these common mistakes and think from a new perspective - you will ultimately learn to embrace and even enjoy international trade shows. Norbert Hültenschmidt, based in Dusseldorf, Germany, has 25 years of experience planning and implementing European trade fairs and trade shows. For more information, Norbert can be reached at nhs@nthdegree.com. Ben Johnson is currently Nth Degree’s International Area Manager and can be reached at bjohnson@nthdegree.com for your international trade show project needs.